It’s been taking longer than expected to get the Siri Guru Granth Sahib Audio Translation recordings going. We have a few regular people recording and just got three new people who are starting to record. Hopefully now I can just create a regular schedule for people so that we can steadily record all the Shabads from Siri Guru Granth Sahib. We have about 400 shabads complete and building momentum. I have wanted to record on a regular basis since it is so nice and like a meditation, but doing so at home has been challenging with my kids and finding quiet time. I might have to just manage the project and leave the recording seva for others. Adi Shakti Singh who is doing the wonderful audio editing seva, sent me a few complete samples . Have a listen to them. I love them…they sound great. The words really sink in. Felt so relaxed after listening. Felt like voice was reaching deep in heart. Beautiful! Thank you so much for undertaking this huge project. What is the music playing in the background of Sat Nirmal Kaur’s reading? It’s perfect. Is it fair that if idea is picked up the other person should be quoted ? Anyway its good that its being recorded. Also, there is no reason why there can’t be many different recordings. If you wish to do a similar recording project, then by all means go for it! The more options the better. All the people recording in this project are all local sangat. Your voices are clear and pronunciation is excellent. The Background is audio is one that I put together from several different things — the main component (the Harp) is from a piece called Rain Lament. In that song though there’s a guitar complimenting it as well. http://ccmixter.org/files/vo1k1/13519 is where you can find the song that I pulled the harp from. The reading is great….personally, I find the addition of repetitive music a bit distracting because it keeps pulling my brain away from contemplating what I’m hearing, but maybe that’s just me. Still, I hope you hang on to copies of vocals alone for some later release. Well its diffcult describing the work by mere words . All I can say is thanks for the Good Godly and Gracious sewa. 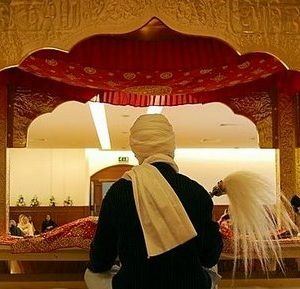 Waheguru! This is beautiful Gurumustuk. I’ve been listening to the recording of Sat Nirmal, it is amazing. The experience is forcing me to deeply listen, and as someone who has never understood the gurmukhi all that well, I am listening AND learning. Beautiful work by beautiful people! I tried to hear the first track a couple of times and I felt that the ambiance sound was a bit higher in terms of the volume. Can you reduce the volume of the background music by like 20%? In my view, this will help us to focus more on the amazing voice recording while listening to the track. I'm aware that the Background volume is too high on that track, I've already fixed it in the 2nd edit that also removed the bang in the background as well. Nice…technology with a real purpose…I am comfortable with combination of reading and music…as it fills out the sound space…and music assists in bringing “me” back when my mind wonders. Voice is also “upfront”. You guys are amazing, I wish I could do some kind of pious work like this. I listen to the Jap Ji and Rehras in English, since doing so my life has truly changed. Becoming a vegetarian was one of the best things I have ever done. I really enjoyed listening to Gurumustuk Singh… Great meditation and very relaxing. I really want the whole of Guru Granth Sahib Ji translated and recorded, as I find it much easier to understand that way. I do however have one query… I have a translation of Guru Granth Sahib Ji in pdf format, but have no idea which part of Guru Granth Sahib Ji either of the recordings is transcribing. Could you please add the title of the transcription to the recording as well. This is wonderful. Are further tracks available yet? Is this the Dr. Sant Singh translation being read? Please let me know if I can help with the reading. Are there any further updates on this? Have not seen any new samples being uploaded? Raman, this is one of many side projects. I had to put it on hold because there was too much going on and was not able to handle this project as well as everything else going on at SikhNet. We will resume work, but since this is volunteer work and a time consuming project it will take some time. Hi, thanks for your message. It would be great if you could keep posting the files as and when they are done. They are really beautiful and I am eagerly waiting for the project to commence. 112539124660857050 - Getting ready for a huge game of tug-o-war with most of the camp.